'There is no greater thing you can do with your life and your work than follow your passions in a way that serves the world and you.' In conversation with a man who perfectly exemplifies the above said quote. Sai Sampath believes that Nature holds the key to our aesthetic, intellectual, cognitive and even spiritual satisfaction; he started an NGO called Eco Fawn and is working towards turning concrete deserts into fertile grounds and gardens. Read on! Q) How did you grow up as a child? What were your interests and dreams back then? Sampath: I grew up playing in mud, (not cricket bat or any other game as my siblings did) planting flower saplings and extirpating it 100 times only to replant in different locations. Even during harsh summers, grandma and mom used to wonder what magic I had in my hands that despite continuous shock I gave to plants, they survived well. I remember a particular incident during school days when tried to call C.M (then C.M.chandra babu naidu) in “Prajalato Mukya Mantri” programme to express my desire of planting 100,000 saplings (during my 7th Class Standard). Q) What made your heart take up this particular task? Can you share with us any particular incident that had a huge impact in this aspect? Sampath: I grew up along with my pets at home. This made me care for them. Mom was from Hyderabad and dad from a tiny village (near Tandur). All my initial years were spent in Hyderabad. I used to visit village during vacation and I grew up watching what my eye could not dare to see easily - deforestation all along the way. I used to sit at the window seat in train and bus and I believe everyone sits for the same reason - to feed the eye, mind and heart with blissful nature. I started to contemplate for what I didn’t like to see – deforestation, crusher machine crushing all the mighty rocks. Q) Who is your idol of inspiration? What is the principle that pushes you to reach more and more milestones in life? Sampath: ‘Partly withheld eyedrop in any living creature(except humans) with perpetual requests to do something in ending atrocities against their class’- This thought in my mind adds fuel to my everyday work. I idolise my mom, Jane Goodall, Wangari Mathai, Akkineni Amala, Maneka Gandhi (only few to name) in contemporary times. Q) What marked the origin of your organization - Eco Fawn? How did it take its form? Who constituted the initial body? Sampath: I always wanted to do something for the nature but realized that it is not easy, particularly for a 23 years old lad. A single leaf working alone provides no shade. 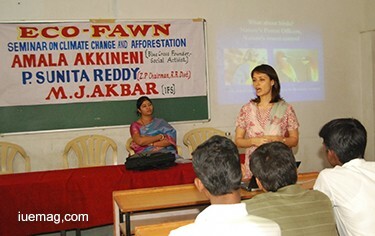 Hence I formed an association with college friends and got my ‘Eco Fawn’ registered on 18th May 2009. Q) What were the hardships involved in the journey of starting this? What are the struggles and challenges that you face today? Sampath: It was smoother to establish an NGO rather than to manage and run it. Launching with the help of my close friends, Eco-Fawn took its form. They supported me enormously with the funding. I never had to tell them what the requirements are. In fact, it was my friends who helped me manage the affairs of the society, they thought they had to support financially so they made contributions and taught me not to go alone, money was often from their savings (sacrificed their time pass money). I had lot of limitations financially in the atmosphere I grew but they never made me feel that as a hinderance. Q) Could you share with us, some of the glorious moments of your life? Quote any heart touching incidents that helped you transform the life of someone which remains special to you. Sampath: Back in my village, my aunt possessed few cows. The practice of selling them off to a butcher in their old age is common and prevalent till date. I could not manoeuvre the entire village to put an end to this treacherous practice but persuaded my paternal aunt successfully from selling an old cow. It was not as easy as falling off a log; my aunt, her neighbors and my relatives were in support of my aunts decision. They counseled me to get a good milk fetching cow rather than the old cow, but I was very blunt. At last, the butcher had to untie the rope around the cow’s neck. It was like the most heart touching truimph ever(I was happy then and even now at the thought of it). I somehow had an apprehension that my aunt may sway back to her decision and made a token advance to withhold her decision and as agreed I paid Rs 8000 in installment to my aunt. I was completely elated because I could stop death at that moment to the cow which served its life, knowing little that one day it could be sent to abattoir just to unburden themselves from harsh summer or other petty issues. Ironically, people who admonished me for investing on a dead body were wrong, the cow consistently gave calf biannually and the number increased to 5. Every summer is an exam for her to just pass it by herself. Q) Have you faced criticism from people? What do you tell yourself in order to overcome stressful situations of that kind? Q) Can you tell us about the afforestation programme that you have launched? How did people respond? Sampath: People accept anything which is remunerative. I had to face problems from officials in district and state level to convince anent proposals I made but found these proposals were, to the credit of officials who portrayed them as their unique ideas. I’m not worried about that for I am content for the work being done but not the way I contemplated and devised the scheme. Q) ‘Employment opportunities arise to the local tribes in the forest protection work.’ What is your take on this statement? Sampath: Yes, this was my theme during 2011 to provide employment opportunities to the local tribes in forest protection work. But, inflation and greed are uncontrollable these days and leads to extreme pressure on natural resources in forest and elsewhere. Q) What according to you are the serious grievances relating to environment that have to be addressed immediately? Sampath: Deforestation, forest land encroachments and subsequent decline of forest area, water harvesting, pesticide and fertilizer management in agriculture, effluent treatment from factories, solid waste management and CPR in villages are some of the issues that need proper addressing. Q) How do you plan your campaigns and gather volunteers? Are there any special training programmes that you conduct for the volunteers? Sampath: Everyone one loves to associate with environment related activities but what about the primary need - salary or honorarium. We comprise a small NGO and could not support such things. We do train the volunteers and it is completely project based. Q) You have filed a petition on the forest encroachments. How did you involve yourself in this? What were the challenges you faced or lessons you learnt during that task? Sampath: I am a social research student. Before making any kind of attempt, I ought to understand the scenario and the truth. Primarily, I gathered information from majority of states where RoFR Act 2006 is implemented(under RTI Act), made report on findings and drafted letters to every constitutional heads and bodies in the government. Coming to the Challenges, I branding myself as an anti tribal for forest protection work. 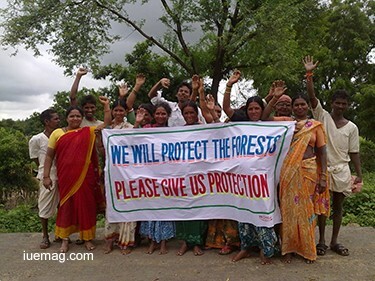 Very little do these tribals realize that in the end the same politicians brand them as anti forest! Q) In order to carry out successful campaigns of social work, government support plays a crucial role. Would you support this statement or oppose? Why so? Sampath: I accept it. It is difficult to go without the government's support. But once the government starts to support for any social work there is no proper planning, there is mass involvement, monitoring & evaluation, administrative barriers and ill political interferences/influences. It all becomes haphazard. If the chief minister has plans to see a state ‘Green’, his administration may not have the same spirit. Q) What are the changes you would like to see in the society through your NGO? What is it that you aspire for your organization in the future? 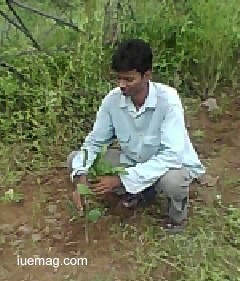 Sampath: People adopting green! We would like to facilitate in plantation programme and show the world steps for successful afforestation and sustainable livelihoods in tribal lives. Q What would be your message to our readers and what could be their role to save the environment. Sampath: We are not the only creatures to boast patent rights on this planet; There are many others silently coexisting with us. Our actions are putting an end to their race. There are many reports almost daily that a new creature is found or creature found is now extinct. There is so much to learn from and about the animal kingdom. The other aspect is about natural resources. We don’t have any right to use or draw indiscriminately. What future are we bequeathing to next generations? ‘Sustainable’ is a very easy word any agency/organization likes to use, it is quite difficult to adopt the term in action. Any facts, figures or references stated here are made by the author & don't reflect the endorsement of iU at all times unless otherwise drafted by official staff at iU. This article was first published here on 27th April 2016.